Asset allocation refers to the portfolio holdings’ distribution, by the type of asset, such as; stocks, mutual funds, ETFs. You can see how your portfolio holdings break down per asset and,for stocks, per sector and key holdings. 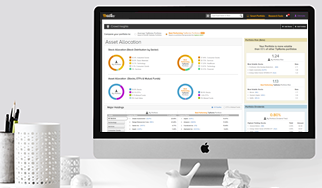 This asset distribution is often used by investors to diversify their portfolios to achieve the preferred risk/reward balance based on their investment strategies. 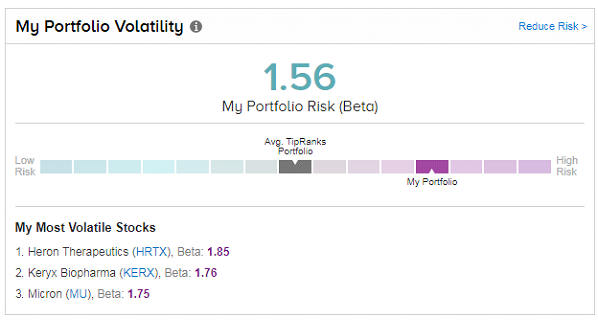 Track your portfolio risk (beta)- Is your portfolio is more or less volatile than other TipRanks portfolios, and which are your riskiest holdings? A beta of over 1 means that the stock is,theoretically, more volatile than the market. Most investment professionals agree that one tactic in reducing risk is to better diversify your assets. Your beta risk profile here could indicate whether you should consider further diversifying your portfolio holdings. Here you will find the overall dividend yield and payout of all your portfolio stocks. The best part is that you can easily monitor your top dividend holdings and all your stocks with upcoming dividend dates. Are there any stocks you should be concerned about? This nifty feature means you don’t have to search through your portfolio stock-by-stock for warning signs. Instead you can immediately find 1) stocks in your portfolio that have substantially decreased in price over the last week, and 2) if an analyst has issued a recent sell rating on any of your stocks. Your portfolio’s P/E ratio is calculated by evaluating the actual P/E of each asset, together with its relative weight of your portfolio total. A growth-oriented portfolio will categorically surpass the average TipRanks portfolio P/E. A value-oriented portfolio will most likely have a lower P/E score than the average. Depending on your financial goals, you can adjust the P/E ratio by altering the stocks, funds, and ETFs allocation in your portfolio. Exchange-traded funds are now expected to grow assets under management to almost double to $6 trillion by 2020, according to research by professional services firm EY. ETFs now provide investors with access to many asset classes that can not only introduce portfolio diversification benefits, but also offer higher expected returns. As part of our goal to provide more transparency in the market, we developed a feature in the Smart Portfolio that now helps you choose similar ETFs and mutual funds with lower management fees to maximize your investing returns. We find similar ETFs and mutual funds by identifying overlaps in sectors, geographies, return, and overall investment philosophies. Similar funds we suggest have behaved more than 98% identically to their counterpart. Step 2: Navigate to My Portfolio Analysis on the lefthand column to see how you can save money on ETF/mutual fund management fees. In this case, if I held 1000 shares in Vanguard Large Cap ETF I could have saved $270 last year if I had switched to Schwab US Large Cap ETF. This is because Vanguard has fees of 0.08% while Schwab has much lower fees of 0.03%. Have a question about the My Portfolio Analysis Tool?